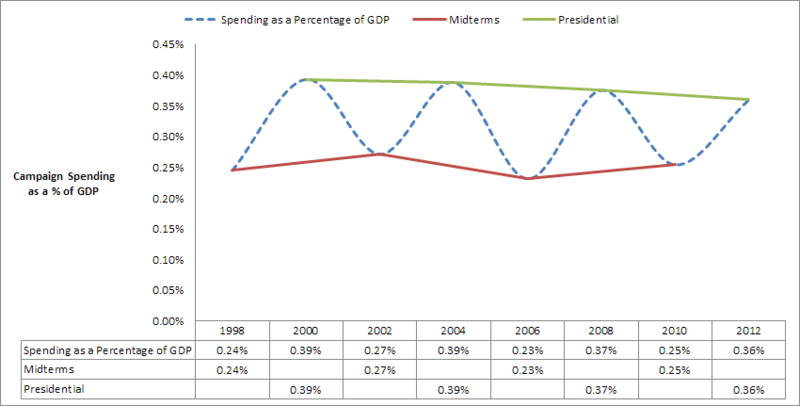 Did the Bipartisan Campaign Reform Act “Bend the Cost Curve” on Campaign Spending? This graph tells a different story than the last one: we can see a clear “bend” after 2002, and another after 2008. 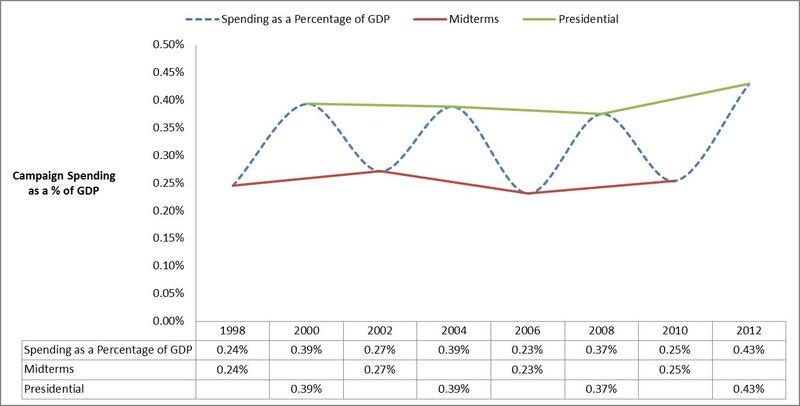 Thus, it’s plausible to suppose that BCRA did bend the cost curve: we spent less of our GDP on elections while its important provisions were in effect. My point yesterday was to offer some predictions and beliefs about the effects of BCRA that militated in favor of overturning it. I maintain that norms are engaged in a reflective equilibrium with our beliefs about the facts of the matter, and that sometimes inaccurate predictions can masquerade as principles. I still think this is true, and I’d only expand that claim: visual representations of facts can and do make arguments. Thursday I made a bad graph, and thus a bad argument. Today I retract it. These new facts must still be interpreted in light of principles: perhaps the effect size is too small to justify the criminalization of partisan political speech. Perhaps the Rent Seeking Model still applies, and politicians were able to extract fewer rents from businesses during the reign of BCRA. (Perhaps, too, we owe it to shareholders to protect them from the unwanted expenditures of the companies they own.) For now I just want to point out that this does give us evidence against the “no effect” hypothesis. 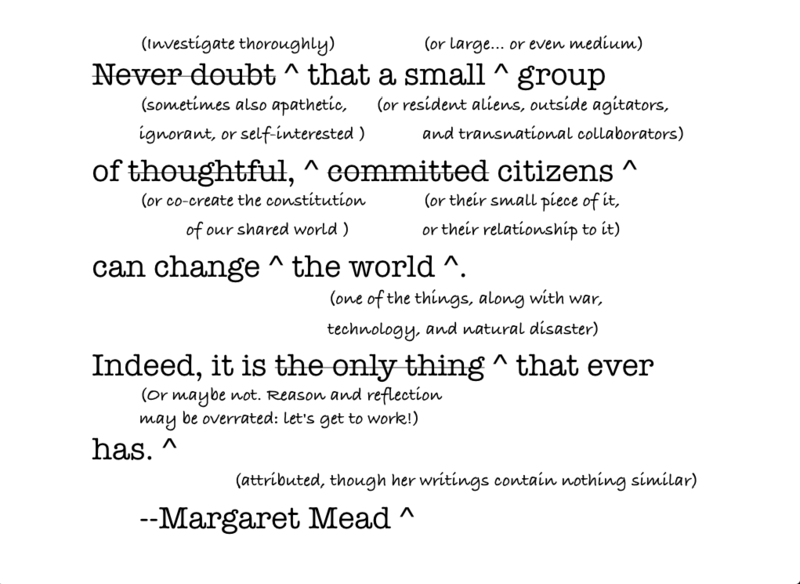 Posted on December 17, 2011 December 17, 2011 Tags Beings and Doings, Believing What's True, Citizens United, GDP, Rent Seeking Model, The Business End2 Comments on Did the Bipartisan Campaign Reform Act “Bend the Cost Curve” on Campaign Spending?